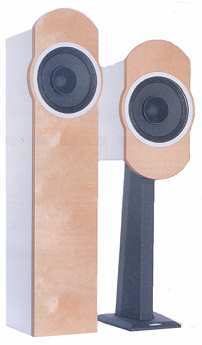 The Dacapo is a sealed cabinet speaker with Ciare CH 250, a full range driver with 97 - 100 dB (2.83V, 1m) sensitivity. Since the low frequencies in a sealed cabinet are somewhat boosted, the Dacapo features (like already the Dynaudio Variovent speakers) a controlled vent to flatten the frequency response. Upon request a 220 x 155 mm universal PCB is available for mounting the crossover components. Upon request a 220 x 155 mm universal PCB is available, where all components, except the large coils, can be mounted.